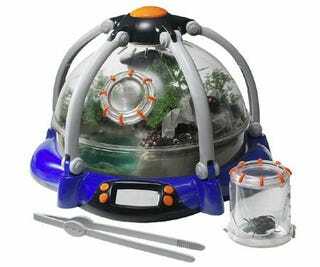 This biosphere from Discovery can supposedly teach kids important things about nature and the environment and all of that crap, but isn't it more important that this biosphere allows children to play god with an assortment of insects living inside the biosphere. Making it rain, controlling the temperature and humidity, poking and prodding with tweezers are all things your overseeing child can do. Forty dollars is a small price to pay to give your kid a god-complex, just like mommy and daddy.